Reki-jo (歴女) are Japanese female history buffs, who may also use the speech and mannerisms of pre-industrial Japan in their social gatherings. Reki-jo are a kind of otaku, people obsessed with a particular interest. Economic activity relating to the fad generates US$725 million per year. Reki-jo is a contraction of "girls who like history", more literally "history-loving girls" (歴史好きの女子, rekishi-zuki no joshi). 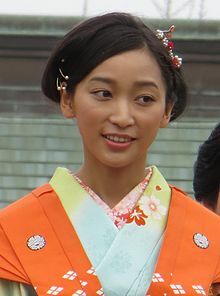 Model Anne Watanabe, daughter of actor Ken Watanabe, is a notable reki-jo. The manga and anime character Rika Yoshitake (吉武 莉華, Yoshitake Rika) from the Genshiken franchise is an example of a reki-jo in popular fiction. In the series Girls und Panzer, the Hippo Team is made up of Ooarai Girls High School's reki-jo clique. ^ Hawking, Richard (January 2010). "reki-jo". ELP web. Retrieved 2010-05-20. ^ a b c Kuhn, Anthony (April 13, 2010). "For Japanese Women, The Past Is The Latest Fad". NPR. ^ Joe, Melinda (7 May 2010). "Make a date with Japan's fanatical 'history girls'". CNN. ^ "Yahoo! 辞書 - 歴女" (in Japanese). Yahoo!. Archived from the original on 2012-03-07. Retrieved 2010-05-19. This page was last edited on 14 April 2018, at 06:59 (UTC).